AWC–SB presents ward-winning writer, best-selling New York Times author, academic and host of the syndicated radio show “The Loh Down on Science” Sandra Tsing Loh. Loh is the author of the best-selling new book The Madwoman In The Volvo: My Year Of Raging Hormones. Loh is also currently in production for her next hilarious one-woman show of the same title. 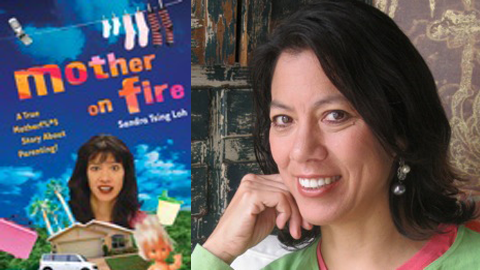 In a voice that is wry, disarming and totally candid, Sandra Tsing Loh tells the moving and laugh-out-loud tale of her roller coaster through “the change.” This is not your grandmother’s menopause story. Loh chronicles utterly relatable, everyday perils: raising preteen daughters, weathering hormonal changes and going through the ups and downs of a career and a relationship. She writes also about an affair and the explosion of her marriage, the pressures of keeping her daughters off Facebook while managing the legal and marital hijinks of her eighty- nine-year-old dad, and speaks hilariously and honestly about her life as a mother, a daughter and an artist. Her previous book, Mother on Fire, was inspired by her comical hit show on weathering the Los Angeles public education system and reflects her passionate commitment to quality public education for all. A huge hit with women, she speaks to the often funny and sometimes poignant struggles that women face, particularly in regards to motherhood, menopause and enduring the little and big storms that life brews. Described as “imaginatively twisted and fearless” by the Los Angeles Times, Loh is a brilliant academic and hysterically funny comedienne and writer. Her sparkling combination of wit and academics easily reaches a wide range of audiences. This accomplished, award-winning talent says that after she earned a BS in physics at Caltech, she went on to “sorely disappoint her Chinese engineer father” by pursuing a career in the liberal arts. Shortly thereafter, she went on to receive Caltech’s Distinguished Alumna Award, its highest honor. Named one of the 50 most influential comedians by Variety, the wickedly smart Loh uses her unique brand of humor to connect to audiences, tailoring each presentation to create a memorable, funny and uplifting experience. This entry was posted in Past Events on October 9, 2014 by Lisa.